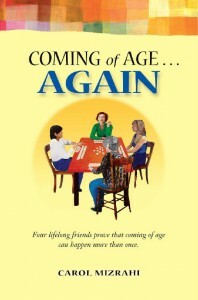 This book tells the story of four friends: Barbara, Irene, Sylvia, and Rochelle. They are all women in their early sixties, and all have very different personalities. Somehow they have stuck together since being very young. It tells the story of the women coming to different points in their life where they aren’t happy, and they take back their lives. It is never too late to be happy. This book was very real to me. It showed problem that real women go through everyday, but it had a humorous twist to it. I found myself laughing out loud more than a couple times! Sometimes when you come across a book that has older characters in it, you may feel that it is only for older folks, but this one is completely different. I greatly enjoyed it! 5/5 Stars. Kept me entertained the whole way through! I nearly cried when the butterfly was killed. Ya know Courtney, when real human experiences are captured on a page, the words should transcend time. Think about it, if you're sixty, you don't have to be sixteen again to write about a teenage experience (assuming you're in touch with the current trends). As long as writers, and everyone for that matter, reach for the truth about who they are, we'll all be able to connect through that intrinsic "feeling" language. Thats very, very true. I like how you put that!